While upgrading today, something caused my wireless network manager to disappear. Not even connecting via wired connection. Is there a patch I can download through windows and send through to my ubuntu, or is it a case of having to reload everything? I tried running two versions back but still no internet access. This is caused by a regression introduced with a fix for libnl3 bug #1511735. As of 2016-05-13 this libnl bug is affecting also users without trusty-proposed, who will almost certainly be directed here by Google. Updated libnl and network-manager packages have already been released, so I recommend a forward upgrade. 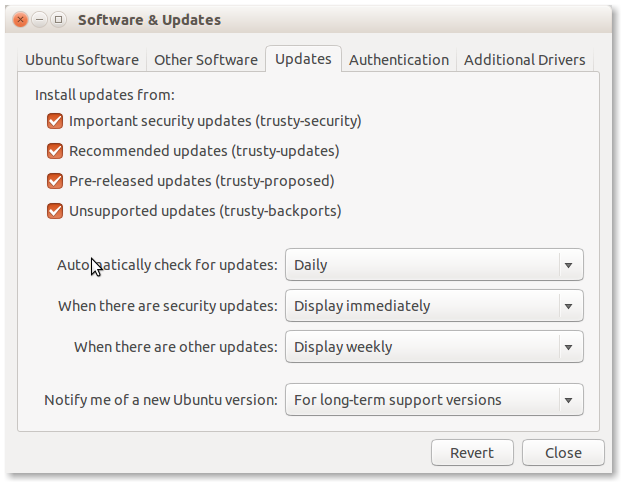 With the network up and running, do an update either using Software Updater or from the terminal using apt-get. 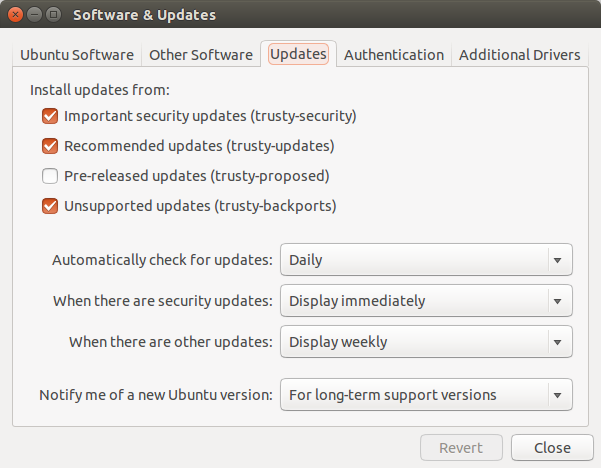 Run Software Updater and update normally. At the time of writing fixed packages have already been released. In addition to the given solution I want to give a general advice. It is not supposed to be turned on. This "problem" affected only those users who turned on the proposed repository and installed a broken package. This repository contains testing packages that are not recommended to install unless you want to test some specific packages. Keep "proposed" off if you do not want this kind of surprises. You can refer to this question for more information. Update to network-manager 0.9.8.8-0ubuntu7.2, and reboot. I had the same problem this morning and downgrading the libnl packages worked too. I rebooted using a rescue CD, downloaded libnl-3-200-3.2.21-1_amd64.deb, libnl-genl-3-200_3.2.21-1_amd64.deb and libnl-route-3-200_3.2.21-1_amd64.deb from http://archive.ubuntu.com/ubuntu/pool/main/libn/libnl3/ , installed it using dpkg -i and rebooted. Networking is back. It may not be the ultimate fix, but it got me going on 14.04 for the time being. Here's the bug report: https://bugs.launchpad.net/ubuntu/+source/network-manager/+bug/1539634. i am a very very new beginner to ubuntu and that too a non technical man having very little background of this computer languages and all. i was not able to understand the asterisk in "sudo dpkg -i libnl-*.deb"
how much ever i tried to install first files individually, then together, then by apt-get; sometime interchanging = in place of _ like 3-200=3.2.21-1 in place of 3-200_3.2.21-1. still no result. searched on net then found out very easy way of doing it. by dragging the file in terminal after "sudo dpkg -i "
then encountered another problem: processing triggers... that too as someone gave suggestion by just "enter and then username and enter" got it solved. was skeptical still. finally it worked. thanks r2rien and friends. Not the answer you're looking for? Browse other questions tagged 14.04 networking network-manager applet or ask your own question. My network manager applet is dumb?